Facebook setup a new milestone as a social networking platform. Besides there many more platform to interact with people. But is all one pack of all features. We can connect with others and as we can do business on Facebook. Mostly commonly we use to connect via groups and pages. Pages are mostly likes used by brands and celebrities. If you want to create then checkout easy guide to grow Facebook page. People create groups for to connect with people of similar interests. Facebook groups are like a community place for discussion and selling things. Facebook groups are of three types may be open, closed and secret. So we can easily create and be a part of any group. But sometimes we create group and then our mind changes and we want to remove all members from Facebook group at once but as we know their no option on Facebook to remove and delete at once. If you want to delete Facebook groups easily but don’t worry here is the solution. 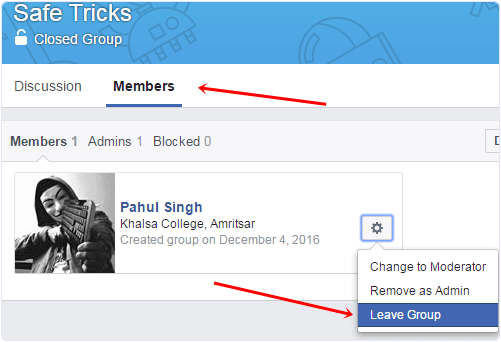 How To Remove All Members From Facebook Group ? As we all are aware that there is no option to delete Facebook. So to proceed with that process we have to remove each and every person from that group to make group deletion option visible. 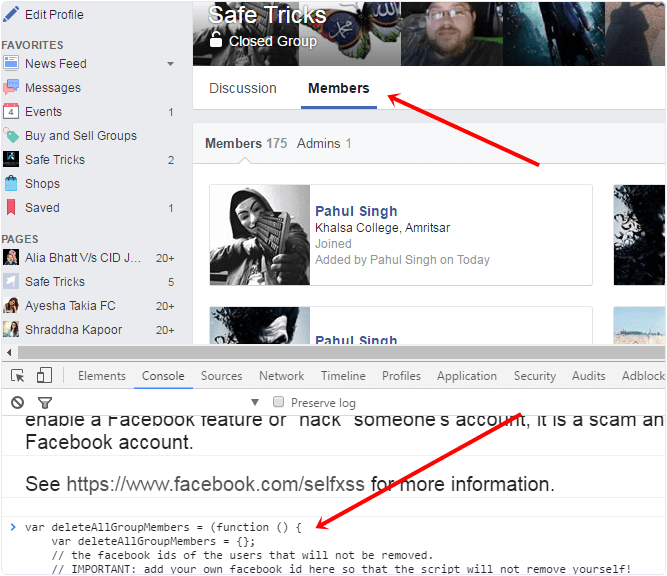 But the another great issue is there even no option to remove all members at once from Facebook group. So we need to manually remove then one by one. No doubt that task will be better if having few hundreds otherwise this task going to be time consuming. To solve this panic situation just below below given steps. First of all open that Facebook group which you want to delete. Now Switch to members tab from navigation. All group list will be visible and make sure you this from account having admin privileges. Now right click anywhere and click on Inspect element or press F12 button from keyboard. Now Copy each and every code given in below script. After that switch to console tab and paste copied script and press enter as shown below. Without few removal process will begin and it will going to take time depend on total members. So its better to leave as it is until its done. How To Delete Facebook Group. ? After Removing all friends from group refresh it. Now only admin id will be left. Simply click on leave group and popup will appear to leave and delete group. Hence, we suggest you to be very careful. Do not start this process unless you have made up your mind and are very sure that you want to delete your Facebook group. Because once it done it cannot be recovered. So make sure you have a backup of all the important information,files & photos in order to avoid inconvenience later. In Conclusion, we hope that this guide will be helpful for you to remove all members from Facebook group and also able to delete Facebook group permanently. Please share your thoughts in comments below and share it as well.